We’ve recently fallen into the habit of having a steak dinner on Sunday nights and of course along with that comes the inevitable question of what to serve alongside. I’ve previously posted these steakhouse side dishes and they’re both great but unfortunately I suffer from “I-can’t-make- the-same-thing-twice-in-one-year” syndrome which can make menu planning very onerous. So this recipe is a result of one such Sunday when I was racking my brain for a side dish that we hadn’t had before. 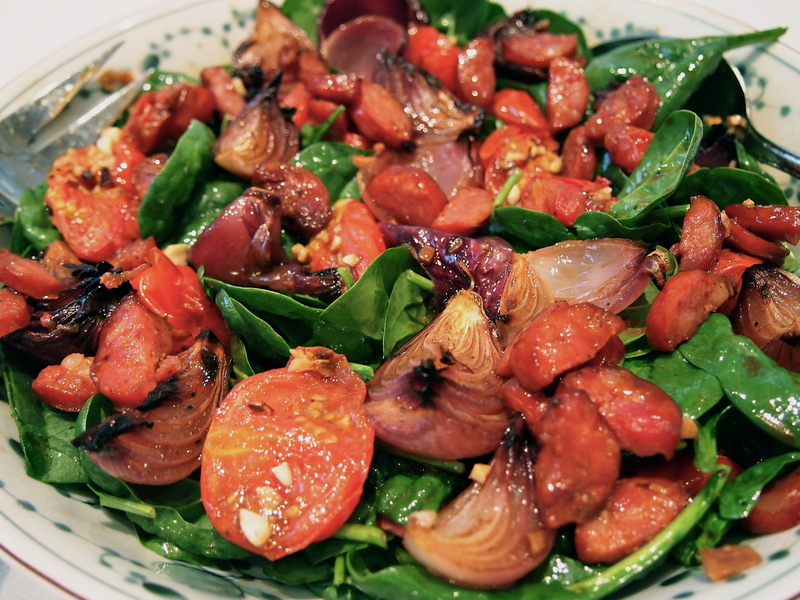 Warm spinach salads are nothing new and are very popular, especially in the States, but I wanted to add a little different twist on the more classic warm spinach salad which normally consist of bacon, and a warm vinaigrette. This salad has enough components to be the only side dish you’ll need to accompany a steak or any other grilled meat/poultry. It’s also substantial enough to serve as an appetiser or entree. My husband declared it was one of the best salads he’s had but unfortunately he’ll now have to wait another year to have it again! Preheat oven to 170C. 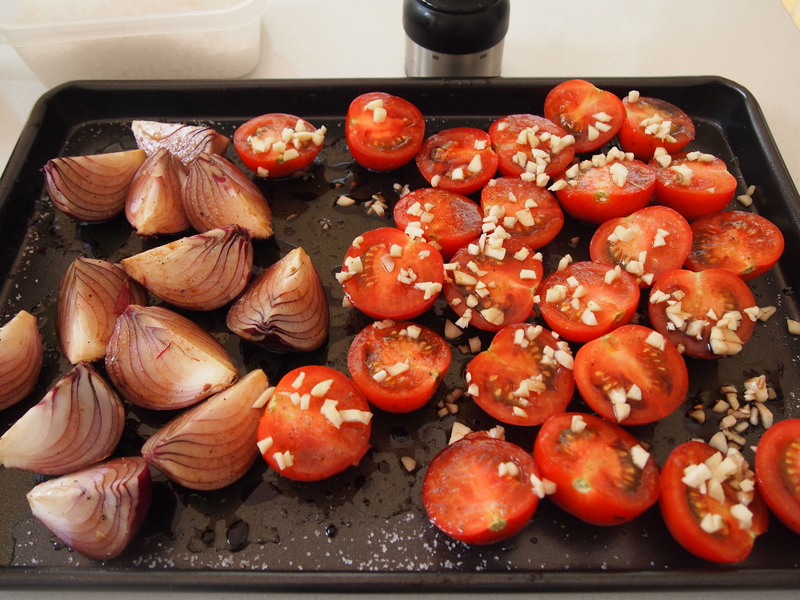 Place the tomatoes and onions on a baking tray, keeping them both separate. Season each with salt and pepper and drizzle generously with olive oil and the balsamic vinegar – the balsamic and oil in the tray will be used to make the dressing later so don’t worry if you think there’s too much. Add the garlic to the tomatoes and toss the tomatoes and onions lightly to coat them in the oil and vinegar but still keep them separated on the tray. Place in the oven and roast for 30 minutes. 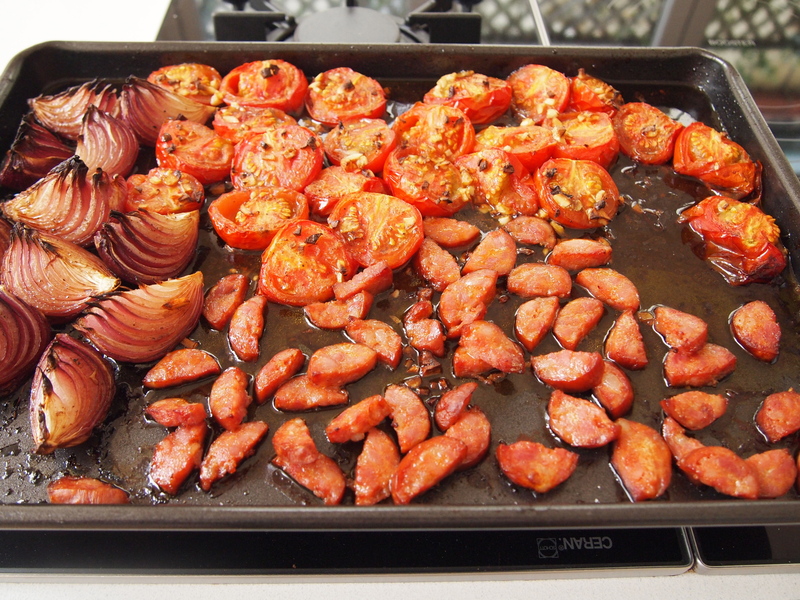 Add the chorizo to a spare spot on the tray and increase heat to 200C and roast for a further 10 minutes or until the onions and chorizo are crispy and golden. Remove from the oven and drain off all the juices from the tray into a small bowl. 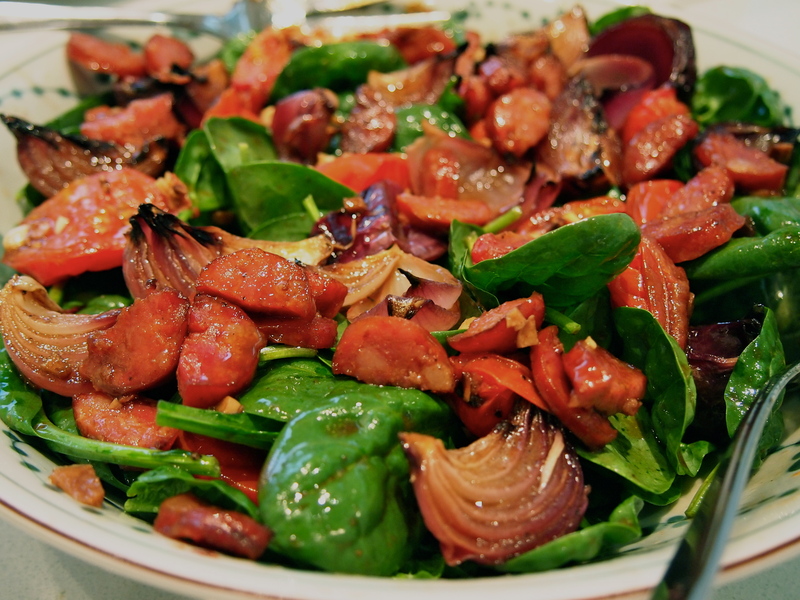 Whilst the vegetable and chorizo are roasting place the spinach leaves in a large salad bowl or platter. You should have been able to retrieve a good amount of oil and balsamic from the roasting tray but if there isn’t enough to make a dressing add a little more balsamic and a splash of oil and whisk well. 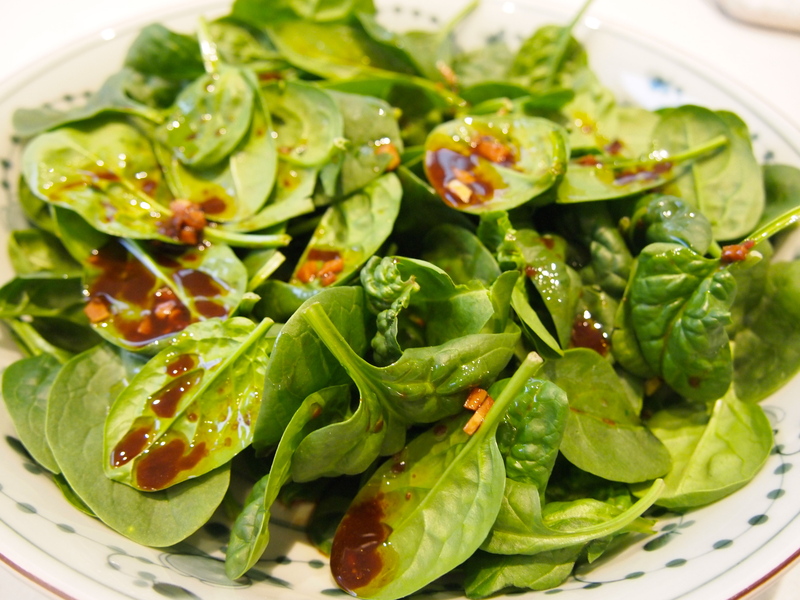 Check seasoning and then pour over the spinach leaves; just add as much as you need to lightly coat the leaves, don’t drown them in dressing. Gently toss through the warm tomatoes, onions and chorizo and add a little more dressing, Serve straight away whilst still warm.